Spring is finally here to elbow Old Man Winter into the background. With spring comes the obligation to get your home ready for the joys of summer – cookouts, parties and celebrating life with family and friends. Chances are that the center of activity will be your wood deck (or porch). 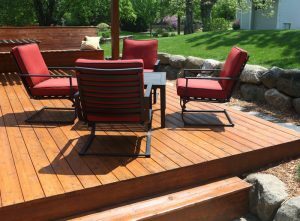 Check out following list of deck protection steps to take this spring to prepare for summer fun. Think of all the challenges your deck will face. Are you sure it’s prepared for all the walking and running? Food and beverage spills? Chairs and tables shuffled around on it? Pets and other animals scampering across it? All of that aside, is your deck even ready for the tough summer weather? Will it be protected from harsh sunlight, scorching heat, pounding rain and stinging hail? If not, your deck will begin to look faded, dull and dirty well before it’s due. Defy the elements and imminent dinginess by having your deck refinished. 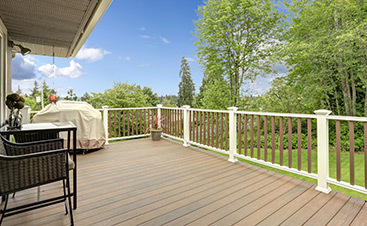 Refinishing your deck every year or two can also prevent it from cracking and splintering. There are no magical secrets to protecting your deck, just old-fashioned professional know-how. Ongoing deck protection will give you years of enjoyment since having a deck is one of the most noteworthy features of any home. It is the perfect place to unwind or have fun gatherings with family and friends. Check your deck’s boards for rot and mildew. If any part of your deck is broken, it should be fixed. Damaged boards need to be replaced. Railings should be rock solid. Not only will a repaired deck look better, it will be safer. Taking care of repairs promptly keeps your deck in good shape for years to come. One of the little pleasures of summer is walking around on bare feet. Slowly running your feet through your yard’s cool grass is a much more enjoyable feeling than the surprising pain of splinters from your deck poking you. Don’t interrupt your playtime looking for a pair of tweezers. A smooth deck is a summertime best friend to your feet. The most crucial task required for refinishing a deck is sanding. Just power washing and staining a deck will not make it last. Sanding exposes the wood’s grain and pores, permitting any stains and sealers you use to properly bond. Every part of the deck should be sanded. Sand full planks, the floor and the rails, especially the top one. It doesn’t matter if your deck is made of a hardwood species such as mahogany, or a softwood species like cedar or pine. Sanding comes first. Bring out the natural beauty of your deck by staining it. 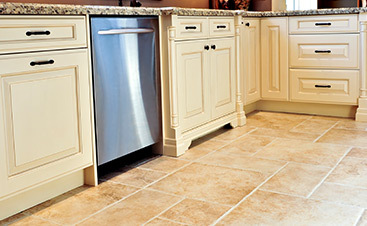 The color of stain you choose will enhance the grain, making it more eye catching. Selecting a stain requires a bit of thought. The experts recommend a transparent stain and clear finishes for new wood. However, for an older deck, a semitransparent stain is recommended because the grain is still visible. The pigment gives aged wood a clean, standard color and helps any new wood used to make repairs blend in. The stain’s pigment helps prevent fading caused by sunlight and lasts longer than clear finishes. Staining is preferable to painting because the wood absorbs the stain. Since paint only coats the wood, it’s prone to chipping and peeling. Stains come in both oil-based and water-based varieties, so how do you choose? A water-based stain is cheaper and easier to use than an oil-based stain, but it doesn’t last as long. Oil-based stain soaks into the wood much better. Should a sealer be used on your deck? The type of wood it’s made out of can be a deciding factor. For example, redwood and cedar don’t need sealer because they are naturally resistant to rot. 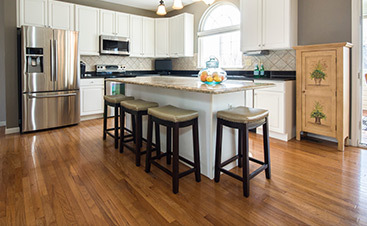 Sealers with ultraviolet light protection help preserve the wood’s natural look instead of turning dark or gray. Having a usable deck not only provides endless enjoyment for you, your family and friends, but it also increases the value of your home. This is fantastic news if you ever decide to sell your home. A deck that’s kept in tip-top condition by regular refinishing should be considered an investment. It add extra entertaining room to your home during the nicest months of the year and becoming a selling feature to potential buyers.